Nothing signals the arrival of spring quite like the heady, sweet fragrance of lilac bushes in full bloom. These long-time favorites produce masses of purple and white blossoms in the spring. Lilac trees thrive in a variety of climates and locations. Like many other flowering bushes, lilacs require the occasional pruning to keep them looking their very best. Pruning encourages fresh, new growth of both foliage and blossoms. Clean your pruning shears before pruning your lilac bushes. Avoid introducing diseases into your healthy lilac shrubs by dipping the blades of your shears into a disinfectant solution. Mix up an effective solution by adding bleach to water in a solution of 9 parts bleach to 1 part water. Prune your lilac bushes in the springtime, immediately after flowering. 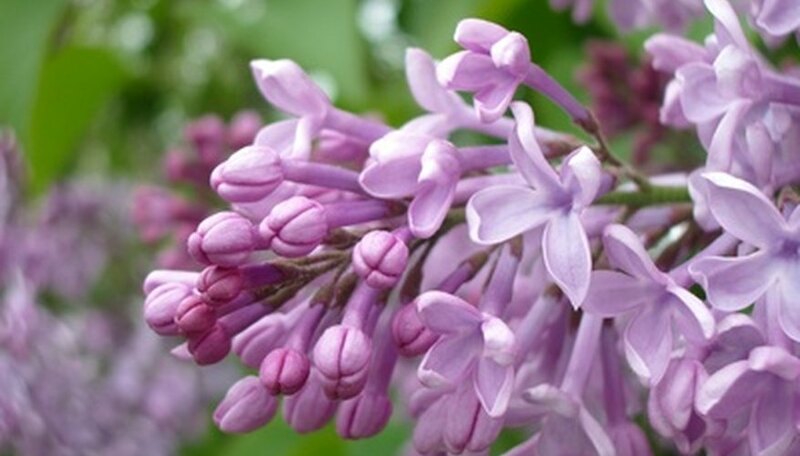 Although many shrubs require fall pruning, lilac bushes produce blossoms on old growth, meaning the blossoms they produce in spring burst forth from the branches produced the prior summer. Avoid limiting next spring’s blossoms by cutting back the branches as soon as flowers begin to fade in the spring. Salvage any lingering blossoms by cutting them and placing them in vases of water. Lilacs make good cut flowers. Cut out dead sections and broken twigs from your healthy lilac shrubs. Remove these in the spring and throughout the year to keep your specimens healthy. Disinfect your shears between cuttings when removing diseased growth to avoid spreading diseases. Cut back about one-third of the growth on mature trees to keep your shrubs uniform and attractive. Select thick, crowded sections to cut out of your healthy bushes. This type of thinning allows even exposure to sunlight and airflow. Remove all cuttings from the area of your lilac shrubs to avoid pest infestations and the growth of mildew. Cut back unsightly growth by removing large, overgrown sections of branches and twigs. Check the soil near the base of the main stems for the appearance of new suckers. Cut these new suckers level with the surface of the soil to keep them from spreading and invading nearby areas of your yard.